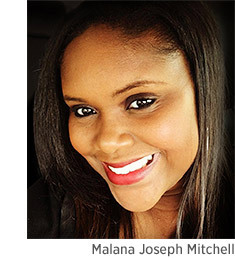 NEW ORLEANS - Malana Joseph Mitchell, Director of Public Relations at the Spears Group, has been elected as the President of the Public Relations Society of America (PRSA) New Orleans Chapter for the 2016 year. A member of PRSA since 2012, she has served on the organization's Board of Directors and recently was Programming Chair. She was also the recipient of the 2015 Ball of Fire Award, presented to the member who goes above and beyond in the chapter. "I am extremely humbled, honored, and excited to serve as the 2016 President of PRSA," said Joseph Mitchell. "With the support of a fantastic board, this is sure to be an exciting and productive year for our New Orleans Chapter." Joseph Mitchell began her career in the public relations field immediately following her graduation from Dillard University in 2005 with a degree in Mass Communications. She began working in the Mayor's Office of Communications. "We are so proud of Malana on this great achievement," said Cleveland Spears, President and CEO of Spears Group. "Her hard work and dedication to our team and various organizations are admired daily by her fellow peers." In her current role as Director of Public Relations at the Spears Group, Joseph Mitchell oversees all communications and community engagement efforts for the firm and their clients. Joseph Mitchell recently received her Master of Arts Degree in Journalism and Mass Communications with a concentration in Public Relations from Kent State University in August of 2015.